Over the past month, Olympia FFA members have competed in multiple events involving their SAE record books, proficiency awards and going for their state degrees. Throughout their FFA careers, a handful of members will keep a record book, recording both their financial situation and record their daily activities in their SAE. SAE stands for Supervised Agriculture Experience, SAE’s can range anywhere from a job at a supermarket, to showing cattle for fun at fairs throughout the year. SAE’s are meant to teach students life lessons that can be applied throughout their lifetime. 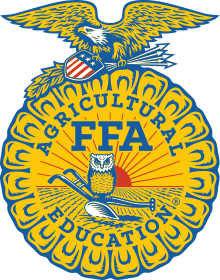 On February 13, four FFA members traveled to Pontiac to compete with their SAE record books, with five students, Lane Miller, Tyler Miller, Molly Schempp, and Dawson Banister, moving on to the district level. These four students traveled to Joliet on Thursday, March 7 to compete with other students in their area at the district level. Part of competing with record books is to do an interview with a committee of judges about your record book. During this time members are asked questions about their book to give judges a better understanding of the SAE record books. Along with competing with SAE record books, FFA members who are juniors or seniors are able to apply for their state FFA degree. This year the Olympia FFA chapter had two students apply for their FFA degree, Lane Miller and Cavit Schempp. Lane Miller successfully obtained his state degree. What does an FFA State degree do for a member? Having a state degree is a huge help when filling out any sort of application, any employer or committee knows what FFA stands for and how hard it is to obtain a state degree. They know that only 2% of all FFA members obtain their state FFA degree.